Recently, during my tour of Germany, this same question was raised. They then enquire, ‘how will you be able to convince other Muslims to follow these teachings, if you believe this to be the true teachings of Islam?’ Our answer is always the same. The evidence for the teachings of Islam that we present can be found in the Holy Quran, Hadith and the Sunnah of the Holy Prophet (SA). We prove with clear evidence that the teachings of Islam have always commanded to fulfil the rights of Allah the Exalted and His creation. As far as the question is concerned that how will we convince other Muslims of this teaching, then the answer to this question is that it was the prophecy of the Holy Prophet (sa) that when Muslims will go astray, the Promised Messiah will be sent to reform the Muslims and present the true teachings of Islam to the world. So, this prophecy of the Holy Prophet (sa) has been fulfilled in the most majestic manner. At the time, when Muslims were not following the true teachings of Islam, Allah the Exalted, sent the Promised Messiah and Mahdi [the guided one]. The Promised Messiah (as) made us appreciate the true teachings of Islam and the Holy Quran. He explained to us the wisdom behind every commandment of the Holy Quran. We Ahmadi Muslims, who have accepted the Promised Messiah (as), are spreading these clear teachings of Islam to Muslims and non-Muslims alike. Our task is to preach the message like missionaries. So, we are doing the task of preaching Islam and God-willing, we shall continue to do so. The progress of the Divine communities and the followers of the prophets does not happen in days. These communities spread and progress slowly. We respond to the Western Media by saying that when you ask us ‘how will we encourage other Muslims to follow these teachings’, our reply lies in the tens of millions of followers of the Ahmadiyya Muslim Community, a vast majority of whom, joined from other Muslim sects. When people understand this message, the true teachings of Islam becomes evident for them, when they become aware of the claim of the Promised Messiah (as) and they start to comprehend the directives and the prophecies of the Holy Prophet (as), then Muslims join our community in vast numbers. People join our community form other religions too. God-willing, one day our minority will turn into a majority. This is the promise of God and we see it being fulfilled each day. Every year, hundreds of thousands of people join the Ahmadiyya Muslim Community and a vast majority of them are from Muslim backgrounds. I will present some examples of how God Almighty opens the way for them and guides those people who join this community. These are some incidents of people, who joined Ahmadiyyat based on their dreams. A lady, Malikah Sahiba from France, explains her incidence of accepting Ahmadiyyat by saying, “One day I prayed to God Almighty, to guide me whether Ahmadiyyat is the true path or not.” She says that in the subsequent three nights, God Almighty showed me three consecutive dreams. In my first dream, I saw that it appears as if it was doomsday and there is unrest everywhere. My sisters and brothers who have accepted Ahmadiyyat, were not stressed at all but quite calm and happy. On the other hand, I was constantly screaming that this is a very dangerous situation. They did not appear to be worried at all and said that they are going to a meeting of the Ahmadiyya Muslim Community. In my dream, in this state of intense fear, I clung on to them. she relates other two dreams and says that after these dreams I was granted satisfaction that these dreams relate to the truthfulness of this community and I took Bai’at and now all her family has accepted Ahmadiyyat. Abdul Aziz Traore Sahib, who has the opportunity to serve the community in the Shapo village of Ivory Coast, says: “One of the elders of the village, Waamaar Traore sahib, saw in a dream that some Arabs came to visit their village. In the dream, he heard people say that these are not true Arabs and they should stay away from them.” He says: “during this dream, I heard a voice saying that if you seek God, then you will find God through these people. He says that a few days after that some Ahmadi missionaries came to our village, at this some villagers start to say that they are not true Muslims, the villagers knew that they were Ahmadi missionaries. When the elder of the village saw all this, he recalled his dream and after a short while, he accepted Ahmadiyyat by taking Bai’at. He attended the Jalsa Salana Ivory Coast with a great vigour and commitment. Bashir Sakla sahib from Brazzaville, Congo, writes: “I started to study the literature and the books of the Ahmadiyya Muslim Community, which made me appreciate the truthfulness of Ahmadiyyat. During this period, one night, I saw in my dream that a man has given me a very colourful outfit in pink and white which was very beautiful. Then, I saw a dream during the month of Ramadan that I was travelling in a luxury bus. This dream granted me satisfaction as the bus is a means of undertaking a journey, therefore the journey that I was to undertake was one of grandeur and majesty. After this dream I accepted Ahmadiyyat. 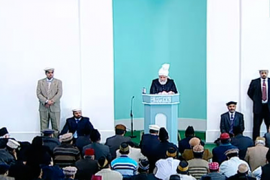 A new convert from the Jama’at of Kyrgyzstan, Ashlan Ramil Sahib, narrates the story of his acceptance of Ahmadiyyat. He says that I was born into a Muslim family. Therefore, the religion of Islam was not alien to me. However, I never reflected on the purpose and need for religion. I met the Sadr of the Jama’at of Kyrgyzstan at my work place. We continued to discuss various topics. When we discussed religion, I slowly and gradually began to understand the truth of Islam and I became aware of the fact that the Muslims of the current time are not practicing the true Islam. After talking to him, I began to find answers to my questions, which were presented to me through Qur’anic references, the practical traditions of the Holy Prophet, authentic books of Ahadeeth, books of the Promised Messiah (as) and various sermons of mine. He says that I started to look into this. Through this, I began to read the Holy Qur’an for the first time. He says that following this, I one day decided to do Bai’at [pledge initiation]. The very same night, I saw in a dream that the friend of my father pointed into a certain direction and said to me that there is a sign over there. However, do not tell anyone about this sign as terrorists will come and destroy it. Hence, I went over to look at the sign. It was a vast garden in which butterfly like creatures were flying around. Hence, I began to think of how we can conceal this sign of Allah the Exalted. Meanwhile, I begin flying like a bird in the dream. He says that I flew to the house of the friends of my father. They are drinking tea and when they see me, they consider me to be merely a bird. However, I say ‘Allahu Akbar’ to them three times, upon which they become frightened as to how this bird is able to speak. He says that I then fly towards the sky and as I do so I turn into an angel. I then look towards the ground and find that everyone has died and no one is alive. He says that I then fly to my house. Following that, within the dream, I wake up whilst I am entering the house. He says that following the dream I decided that Allah the Exalted bestowed me with this spiritual strength. Hence, I performed the Bai’at after this and entered the Ahmadiyya Jama’at. ‘Abd-ul-Hadi Sahib from Egypt says that quite some time prior to finding out about Ahmadiyyat, I saw in a dream that I am treading on a deserted and abandoned path towards an unknown destination. Meanwhile, a pious person approaches me and diverts me onto another path. The strange thing is that without showing any resistance, I happily begin treading on that path, which the pious man diverted me on. The reason for this is that his compassionate conduct made me feel as if he saved me from misfortune and diverted me onto a path of fortune and many blessings. After treading on this path for a while and reaching an elevated place, I turn towards the other path upon which I see a tyrant forcefully acquiring labour from people. Seeing this, I begin to think that if the pious man had not diverted me from this path, today I would also be a victim of this very cruelty as various other people are. In the dream, this thought enters my mind that perhaps this pious person was God’s prophet Moses (as). He says that after quite some time, I came to know of the Jama’at and I understood that the path upon which I was treading lead towards ruin and destruction. Furthermore, [I also understood that] the pious man, who diverted me from this path onto a new one, was the Promised Messiah and this new path was that of Ahmadiyyat i.e. the true Islam. Thus, these are some examples which I have presented. One of them is from Kazan, Kyrgyzstan, the former republic of Russia, a European country, Western Africa, central Africa and yet another from an Arab country. They are people of different nations and different tongues; however, they are all being guided in the same manner. Who is doing this? It is most certainly Allah the Exalted, Who is providing this guidance for them, Who told the Promised Messiah (as) that I will increase the party of your sincere and devoted loved ones. Then, Dr Hijaz Kareem Sahib from Algeria, states: ‘I had become completely disappointed by the distorted teaching and the false interpretations of the Holy Qur’an. I saw in a dream that I was passing through a town at night with my friends and a light was travelling alongside us. In the midst of that, the phone rang and as I looked at the phone, I saw that it was displaying the phone number of the Imam Mahdi (as). I decided in my heart to call him back; if he did not answer the call, he would be a true prophet, otherwise not. I do not know why, during the dream, I thought that prophets do not answer calls. Thus, I called him. The phone kept ringing for a long time but he did not pick up the phone. Then, he made an awe-inspiring manifestation. After this, I woke up due to intense fear. It was fajr time. I was certain that the dream was true. Then I performed bai’at. Ahmadiyyat was established in three villages of the Casamance region of Senegal. Upon witnessing the progress of Jama’at in those villages, the anti-Ahmadiyya clerics, along with the [villages’] chief, decided to pray against the Jama’at. They used to recite the Holy Qur’an and then beat the floor with their hands – they were all muslims – and say, ‘may Allah the Almighty destroy the Jama’at and their missionary.’ However, Allah the Almighty took action in this way that just a few days after their imprecation their chief imam was stung by a snake. Many of those oponents were bitten by snakes and died. After that, the people approached our missionary and our missionary was not aware that these people had prayed against the Jama’at. The villages themselves narrated the entire incident to him and said: ‘Save us for our own imprecation has plagued us. Do something for us!’ Thus, the missionary went to their village and told them about this challenge of the Promised Messiah (as) that God will turn people’s curses against them and He will grant progress to the Jama’at. Now, by the Grace of Allah, more than 700 people from, all the three villages, after performing bai’at, have come into the fold of Ahmadiyyat. Sometimes opponents themselves open the door for righteous people to discovering the truth. A Mualim (religious teacher) from the Goromu Region of Burkina Faso relates: ‘From our Goromu Jamaat a Wahabi Imam’s son accepted Ahmadiyyat and faced intense opposition from his father. This new Ahmadi son became very worried and started to pray. One day he saw in a dream that a person says to him: ‘remain steadfast upon Ahmadiyyat if you desire salvation.’ This dream infused greater resolve in him and he said to his father, ‘do whatever you please, however now I cannot leave Ahmadiyyat.’ Thus, when Allah the Almighty entrenches Ahmadiyyat in the hearts of those living even thousands of miles away, He also grants them steadfastness. A local Muallim from Benin, Taufeeq Sahib, writes: ‘An acquaintance, Bamaisoor Kareem Sahib, was enabled to convert from Christianity and accept Ahmadiyyat. He invited us to his village, Haitee, to preach there saying ‘even if no one accepts Ahmadiyyat and no matter how much opposition I face, I am an Ahmadi and will remain one and will continue to preach alone.’ This is the passion for preaching in new Ahmadis which Ahmadis of old should also derive lesson from. An acquaintance from Ivory Coast, Demayla sahib narrates the incident of his acceptance of Ahmadiyyat. He says, “I used to worship idols but one day I saw in a dream that an old lady gives me a water pot and a prayer rug and says, ‘You should offer salat’. Therefore, I began to offer salat in a non-Ahmadi mosque but even then, my attention was towards idol worshiping. I saw that dream again after a few days and she told me again that I should offer salat. '” He says “I became perplexed regarding this matter as I had already started to pray. So what could this dream mean? So, I narrated this dream to my brother who was an Ahmadi. He said, “The interpretation of this dream is that you should accept Ahmadiyyat.’ Therefore, I took his advice and contacted a missionary of the Jama’at and took the Oath of Allegiance after doing some research. A missionary from Kazan writes that on June 2014, Fareed Ibrahim sahib, who is a member of the Kazan Jama’at, hung a photo of the Promised Messiah (as) in his shop and wrote underneath it that ‘this is the long-awaited Imam Mahdi who has appeared’, along with that he also wrote the Jama’at website link. His shop is located in the main market area and approximately ten thousand people walk past it daily and through this they contact the Jama’at. This opens up new ways of tabligh and this is one of the ways people have found to do tabligh. Ameer sahib of Burkina Faso writes: “One of our members, Pareh Idrees sahib, who is a new convert said: ‘Having taking the oath of allegiance one day I saw in a dream that my state before was covered in darkness and my present state is one that is full of light.’ By the grace of Allah Mr Pareh Sahib has become a regular preacher in the way of Allah and carries out great endeavours in the field of Tabligh. Thus, God Almighty is slowly bringing people towards the true teachings of Islam and God Willing, through the Promised Messiah (as), the true message of Ahmadiyyat will prevail all over the world. May Allah enable every one of us to partake of these blessings by constantly inviting others towards the path of God. After the prayers, I will lead two funeral prayers in absentia. The first is of Mrs Khurshid Ruqayya Sahiba, who was the wife of Maulvi Manzoor Ahmad Sahib Ganokhe, one of the Dervish of Qadian. Due to the will of God she passed away on 1st September, the day of Hajj-e-Akbar. To Allah we belong and to Him shall we return. The deceased was regular in her five daily prayers as well as the Tahajjud [pre-dawn voluntary]. She regularly offered prayers and was very hospitable. She was an ardent devotee of Khilafat and would always look after those in need. The deceased was a Moosia [part of the institution of Al-Wasiyyat]. She is survived by two sons and two daughters. One of her son-in-laws who is currently living in France is originally from Morocco. May Allah the Almighty elevate the status of the deceased and enable her children to continue her good deeds. The second funeral is of Dr Salahuddin Sahib who resided in New Jersey, USA. He was the son of Maulvi Imam-ud-Din Sahib, the missionary of Indonesia. He passed away on 10th September 2017 after suffering a heart attack. To Allah we belong and to Him shall we return. The deceased completed his PhD in the field of science from New Jersey In the time of Khalifatul Masih IV (rh) he would visit frequently and aside from the PS [Private Secretary] office, he also worked as part of the Security Staff. Whether it was office work or his security duty, he always completed his duties with full responsibility. He had such noble qualities that would attract people towards him and made him popular amongst the people. Despite these qualities he had a very humble and meek nature. He had the quality of being able to hold a conversation with people from all walks of life. I knew him from from Rabwah from my childhood and even after my Khilafat, I saw that he maintained a special relationship of loyalty, which was a relationship of love and affection for Khilafat. May Allah the Almighty elevate his status. He never married, thus, may Allah grant steadfastness to his sisters and may Allah enable his virtues to continue on in the progeny of Maulvi Imam-ud-Din Sahib.